The most wanted feature in Excel E-Maps is available now in E-Map Pro. 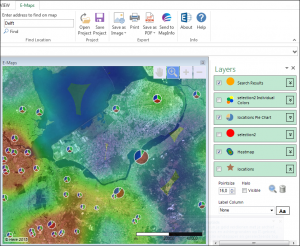 Save your map layers, points, heatmap, thematics in a Project file. The project file (a file with emp-extension) opens your Excel file where you based the map on and it generates all the layers again. The geocoding is done automatically, with the latest address, the creation of the thematic map as well as the labels. A Project saves you time and gives you the same map. See how it works on youtube. Read the License Agreement before you activate E-Maps.